This amazing book shows how to make money with your typing skills and typewriter, part or full-time from your home. Many money-making ways. By Van Gogh. How to make money with your typewriter in spare-time from your own home. These easy tips also make great sense for home computer owners too! You have a story that will sell, but how to get it into the hands of those who will pay to publish it? Freelance writer Gordon Young shares his experience. He reveals the techniques you can use to become successful in freelance writing. This is a practical guide to getting published and it covers all the aspects of breaking into this lucrative field. 120 pages, 6 x 9 soft cover book with glossary." Nothing is more rewarding than seeing your work in print - and getting paid for it. Let HOW TO BECOME A SUCCESSFUL FREELANCE WRITER be your guide to this lucrative field. By Van Gogh. This is a must-read book for all self-publishers. An unusual book by anyone's standards. Self-publishing? Yes, thousands of people all over the world are getting rich and enjoying it using the secret and profit ideas in this book. What they can do, you can too! Some people write for money, some for the fame. But that is not the whole truth. The urge to write is an innate need just like the urge to procreate! Everyone feels it. You must satisfy that urge or it will bring you down with disease, stress, accidents, misfortunes and untimely death. Write and publish those 'bright ideas' now hanging around in your head and you benefit your fellows everywhere. Your ideas are important not only to your total health but also that of the 'world' you live by and in. You could make the difference. Believe it, and you will achieve it. Convert your ideas into riches, personal success or peace of mind ... now. This practical and candid book will show you how to succeed with limited capital and experience. Everyone - regardless of race, rank, status, dogma or whatever else - must self-publish and profit from it. Go for it now, and experience how the power of your Subconscious Mind can be unleashed to guide you to grow to be the best you can be. A Copyright License giving you the legal right to reprint and resell this best seller in your state/country is available for an additional US$12,000. You become the Publisher and prime source. You keep all your profits! A Translation License is also available for US$12,000. You can live more and better by your mind and heart than by your brain. This will be revealed to you when you write and publish your ideas to people everywhere. How would I know? I've been there ... I've done it ... And I'm hoping you will too! So stop thinking and start doing. Everything you need to know has been packed into this book! Go for it! First steps to becoming your own author/publisher. Convert your ideas and knowledge into money making books. Achieve major success even if you’re not a good writer. Let other people make money for you. Learn how to write about any subject, copyright your work, and make money being your own boss. By Jay Barnes. Turn those ideas in your head into CA$H. 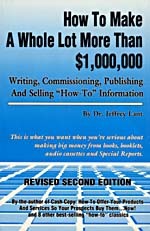 Concise instructions, illustrations, and exercises developed by a long-time publisher and author teach you how to develop ideas into moneymaking reports and books. A priceless collection of workable techniques that will show you the easy steps to turning your knowledge and experience into marketable books and reports that you can sell at 10 times your printing cost or more! You must read this book! That's a mere sampling. The guidebook provides you with full particulars, on all important aspects of writing and selling information. How you too can cash in big on the vast folio market. By Dr. Jeffrey Lant, a recognized master of the "how-to" genre. Here in one information-packed volume, people who are producing or who want to produce "how-to" books, booklets, audio cassettes, and Special Reports get the precise details they need to create materials that really do deliver solid, easy-to-follow, ready-to-use guidelines ... not just vague, infuriating verbiage. This is the ultimate 'how-to" book so designed that by following its directions, authors will produce products that readers and listeners must benefit from if only they follow the directions! What's more, HOW TO MAKE A WHOLE LOT MORE THAN $1,000,000 ... offers the exact marketing guidelines that product producers need so that the superior products they create will be sold fast - thereby making the creators rich. Dr. Lant provides a formula showing authors exactly what they must do to produce the right product and how to market them so they can draw income for years...even decades. And, yes, a whole lot more! This large, 552-page book can get you started on the right foot in publishing. It can show you mistakes you are making now in your publishing and marketing efforts and how to correct them. Please read the How To Order INSTRUCTIONS before ordering. Orders to all countries are shipped by regular surface mail. Before ordering, please send an email to "e.verb@yahoo.com" or telephone (Malaysia) 017-5231484 / WHATSAPP +60178705831 //or SMS to (Malaysia) 017-5231484 / WHATSAPP +60178705831 //to confirm prices, shipping, delivery, bonuses, payment and availability. Thank you. "A problem is only something in which you do not know the answer for. You should welcome it as a challenge to improve yourself and produce your best."